Go to Google Developer Console: https://console.developers.google.com. And then click on Credentials link. If you do not have projects yet, please click "Create Project". Give your project a name and click "Create". Click on "Create credentials" to expand dropdown list and select "API Key". Click on your "API Key" to edit it. 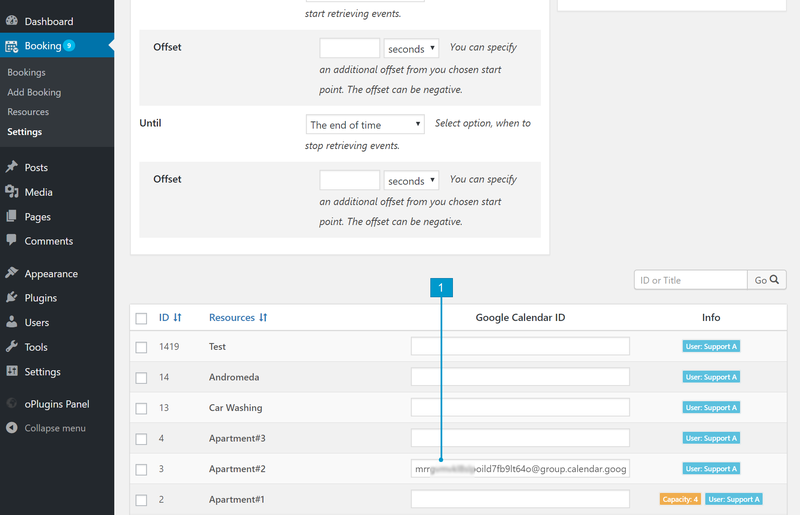 Copy "API Key" (later we will paste it into Google API Key field at Booking > Settings > Sync > Google Calendar Events Import page in your WP admin panel). Then be sure to select "Key restriction" as "None" and click on Save button. Please be sure that you have NOT restricted the Google API key, otherwise its can be reason of not ability to import events. Navigate to your Google calendars. Open the settings for the calendar. Navigate to Access permissions section. Click the checkbox to "Make available to public". Do not select other option (be sure that was selected "See all events details"). Save settings. Now copy the Calendar ID to use in the Booking > Settings > Sync > Google Calendar Events Import page in your WP admin panel for "Calendar ID" field(s). Do not use the entire XML feed URL (starting from http) and do not use simple ID (term before @), like: XXXXXX. 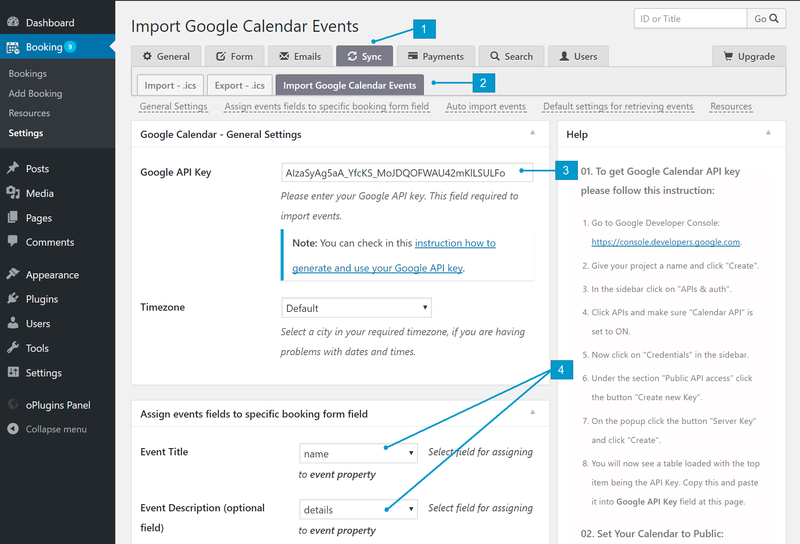 Open your WordPress admin panel and Navigate to Booking > Settings > Sync > Import Google Calendar Events page. Paste your Google API Key and Google Calendar ID into specific fields. Important! Please be sure that you do not paste any white spaces at the beginning or ending of API Key or Google Calendar ID. Save the changes. In the paid versions of Booking Calendar you can assign at this page different Google Calendar ID for the different booking resources. Open Booking Listing page and switch to the "Actions toolbar", then click on "Import" button. In popup dialog configure your parameters (during first test import, please be sure that you selected time interval, where for sure exist your Google Calendar Events). And then click on Import button. You have to see your imported events. Reload the page to see them as bookings.